That decree simmered up animosity because “Jewish merchants had their eyes on the fur, timber, and other resources that lay beyond the line of demarcation.”  When combat was inaugurated by the Battles of Lexington and Concord, a variety of posses pounced from New York, Philadelphia, Newport, Charleston, and Savannah. Some were military-oriented, composed of heroes-to-be like Mordecai Sheftall, Jacob Pinto, and Isaac De Costa; Solomon Bush, the Bordeaux-born Benjamin Rones, David Cardozo, and the much-celebrated Francis Salvador, who blockaded, bulleted and barricaded the British, while another cadre of businessmen and merchants utilized their resources, ships, materiel and brain power to impede the progression of the enemy, achieve freedom for the country, and win the war. Michael and Bernard Gratz of Philadelphia signed pledges to cease trading with the British, and supplied gunpowder and firearms to George Washington’s troops. Along with Solomon Bush, they underwrote the soldiers’ rations at Fort Pitt, PA.
Isaac Moses and Samuel Myers loaded their vessels with cannon to overturn British ships. They were “blockade runners” who purchased goods in Amsterdam, then moved them to St. Eustatius Island for surreptitious transport back to America. Moses was also the wealthiest Jew in Philadelphia. In 1781, he offered 3,000 pounds sterling to replenish the Continental Army with necessities, and bought bills of credit alongside Mordecai Sheftall and Michael Gratz to sustain the Treasury. Aaron Lopez, once known as “The Merchant Prince of Newport” because of his armada of 100 ships, was dead by 1782 from a fluke accident, and eulogized by the future president of Yale, Rev. Ezra Stiles. The equally loyal Solomon Simson donated cannon and lead to make bullets. He was also a business associate of David Franks, who furnished food to the British prisoners — a lucrative business until it ran out of money. Franks was fired in 1778, accused of having British sympathies, tried, acquitted, but never quite forgiven by society. Samuel De Lucena dispatched potassium carbonate to fashion soap and glass as Joseph Simon reheated his forge to manufacture Henry rifles. Jacob Isaacs sent munitions. Meanwhile, nephew David Salisbury Franks became a lieutenant colonel with George Washington, then an aide-de-camp to Benedict Arnold. After Arnold was convicted for treason, Franks’s credibility was besmirched despite an investigation that absolved him, and a return to the Washington command with a promotion. Dr. Phillip Moses Russell was Washington’s surgeon general at Valley Forge, while Dr. David de Isaac Cohen Nassy tended to Philadelphians, affectionately, during a yellow fever epidemic. He had a better cure rate than the revered Dr. Benjamin Rush, a former signatory to the Declaration of Independence, who opted for a treatment of more bleeding and less heart. Perhaps the most important Jew of the era was Haym Salomon. Of Polish birth, he immigrated to America, and “adopted” Liberty. He was ordered by Washington to level British warehouses; he was caught, arrested, and condemned to execution. When the British learned of his facility with languages — Salomon spoke 10 — they decided to use him as a translator. In a twist, Salomon transmitted phony messages, which facilitated his escape. Afterwards, he re-invigorated his broker business, and was engaged by the Dutch and French as a securities agent. Salomon floated loans to the government without charging fees, equipped military units, servicemen, and intermittently paid the salaries of Thomas Jefferson, James Madison, and James Monroe when the Treasury was nearly broke. Meanwhile, in Savannah, Abigail Minis and her nine children were also toiling. A prosperous innkeeper, she stocked Washington’s troops with homegrown agricultural products until the British became suspicious. Minis relocated to Charleston and resumed her pro-Revolutionary works. Her son, Philip, contributed $11,000 to cover the salaries of the North Carolina and Virginia Regiments. In 1776, he was appointed acting paymaster of Georgia’s regimental forces; by the end of the War, George Washington acknowledged him as a hero. According to Jerry Klinger, president of the Jewish American Society for Historic Preservation, the War was at a stalemate until the British realized the Jewish merchants had a formidable presence in St. Eustatius. Admiral Sir George Rodney was summoned to shut down the island. In his wrath, he burnt Jewish homes, and the 1739 synagogue, Honen Dalim. While Rodney ransacked, Lord Cornwallis and his men were wobbling in the Carolinas; they retreated to Yorktown, VA. He hoped for reinforcements, but the French Admiral, Francois-Joseph de Grasse, appeared with 3,000 troops and trounced the British ships sent to his rescue at the Battle of the Chesapeake in September, 1781. Ironically, if it had not been for Rodney’s anti-Semitic tempest, he would not have “forgotten” about the rest of the War, and the British strategy might not have veered off course. Robert St. John, Jews, Justice and Judaism: A Narrative of the Role Played by the Jews in Shaping American History (New York: Doubleday and Company, Inc., 1969). Hasia Diner, Jewish Americans: The Immigrant Experience (Publishers Group West, 2002). Jacob R. Marcus, “The Jew and the American Revolution,” American Jewish Archives (1974). Jerry Klinger, “How the Jews Saved the American Revolution,” Jewish Magazine (June 2004). Diner, Hasia. Jewish Americans: The Immigrant Experience. Fairfield, CT: Hugh Lauter Levin Associates, 2002. Feldberg, Michael, PhD. Blessings of Freedom: Chapters in American Jewish History. New Jersey: Ktav Publishing House, Inc., 2002. Reiss, Oscar. The Jew in Colonial America. North Carolina: McFarland & Company, Publishers, 2004. Schwartz, Laurens R. Jews and the American Revolution: Haym Salomon and Others. North Carolina: McFarland & Company, Inc., Publishers, 1987. St. John, Robert. Jews, Justice and Judaism: A Narrative of the Role Played by the Jews in Shaping American History. New York: Doubleday and Company, Inc., 1969. Klinger, Jerry. “How the Jews Saved the American Revolution,” Jewish Magazine (2004). Marcus. 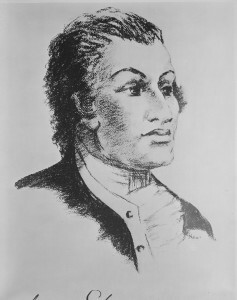 Jacob R. “The Jew and the American Revolution,” American Jewish Archives (1974). Kaplan, Earl, “Jews in the British Colonies During the Revolutionary Period, 1775-1783, As Reflected in Marcus’s American Jewry, Documents, Eighteenth Century,” January 14, 1973. Rosencrantz, Dale, “A Study of the Military, Economic, and Financial Contributions of the Jews in the American Revolutionary Period, 1776-1783”; Spring 1977. Sarna, Jonathan D., “The impact of the American Revolution on the American Jews,” Modern Judaism 1 (1981). Wolf, Rick, “Major Contributions by Jews to the Revolution,” (not dated). Florida Atlantic University Libraries. “Jewish Heroes and Heroines of America: From Colonial Times to 1900.” http://www.fau.edu.library/brodytoc.htm.